For gas grills, heat to the highest setting. For charcoal grills, get the charcoal going and ready to cook. 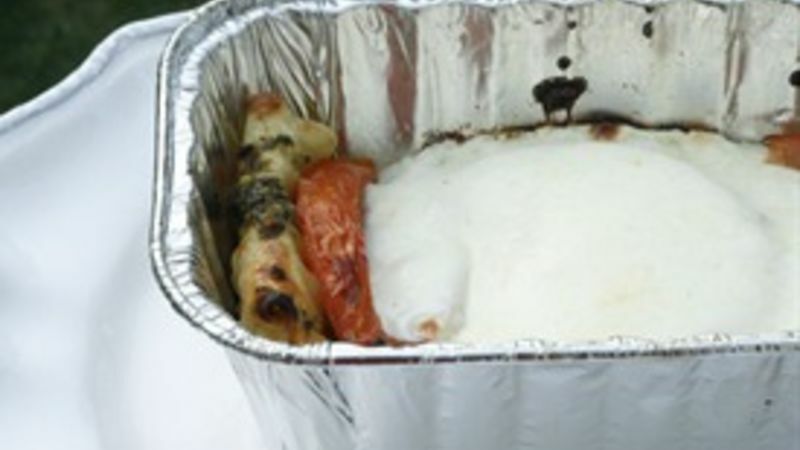 You will need four disposable mini loaf pans. In each pan, place one lasagna noodle along the length of the pan, with half of it hanging out over the edge. Spoon 1 tablespoon pesto onto the noodle, spreading out gently. Top with tomato slices, placed edge to edge along the length of the pan. Top with one slice mozzarella. Fold the lasagna noodle over the mozzarella. Spoon one tablespoon pesto over, and spread it out. Top with more tomato slices and a slice of mozzarella. Repeat until all four are made. Place the mini loaf pans onto the heated grill (direct heat, for charcoal) and cover with the grill lid. Cook for about 10 minutes, until hot and bubbly. The edges should be ever-so-slightly browned.